Theology, philosophy and ethics. I explain here what I try to do. Brought up in a Somerset vicarage by an anglo-catholic father and a Greek mother, I was the one out of three boys who followed into the ordained ministry. After graduating, in addition to theological training I spent a few years as a nurse and then a social worker before ordination at Manchester in June 1976. The following month I married Marguerite, and since then she and the children have followed me clockwise round the Peak District and then off to Liverpool while I alternated between parish priest and university chaplain, also doing some part- time teaching in Ethics and Philosophy. In 2002 I was diagnosed with ME (Chronic Fatigue) and took early retirement. Since then I have developed my research interests, chiefly in theology. Otherwise my main activities have been with Modern Church: General Secretary 2002-2013, Editor of its journal Modern Believing from 2013. I contribute to the leadership of the services at St Bride’s Church, Liverpool. I am a member of the Green Party. When I can I attend Philosophy in Pubs. has had a previous existence. 30 years ago it was my home made wine and beer. This is me drinking it at a University Anglican Fellowship barbecue in 1988. Sadly it is no longer drinkable. There are some who think it never was. ‘Worthy’ is a hamlet; ‘clat’ means one of two things. It may be a subdivision of a hundred, which is a subdivision of a shire. Or it may be a common weed. 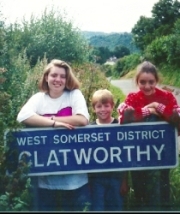 In Somerset there is a Clatworthy village with a Clatworthy Reservoir and a Clatworthy nature trail; evidence below. The children are mine. From left to right: Joanna, Stephen & Rebecca.